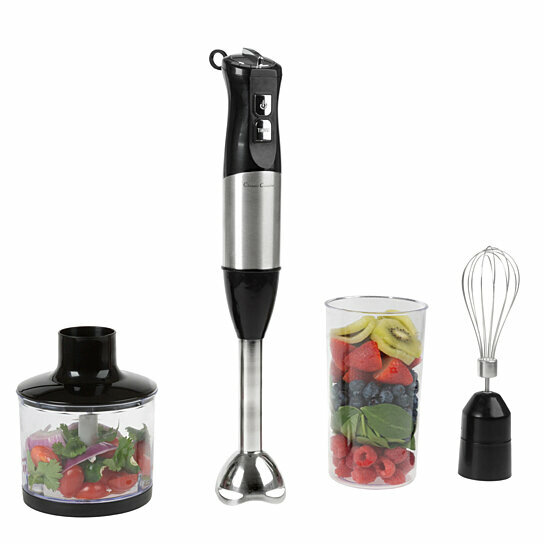 Conquer even the most challenging recipes in your cookbook with this versatile stainless steel immersion blender, featuring a hand blender with a whisk, food processor cup and 32 oz beaker so you can whisk, whip or chop your way to a delicious meal. Think milkshakes, smoothies, meringue, whipped cream, salsa, pesto and much more. Power stick - 9"x 2"
Blender stick - 8" x 2.63"
Chopper cup - 6" x 4.25"
Whisk - 9" x 2"